I decided in the run up to Christmas to make an outfit to wear on Christmas day. I've had Vogue 8847 in my stash for a while now but after purchasing it I wasn't sure if I liked it. I chose to make view A, although not cut crosswise, as I liked the shaped front hemline. 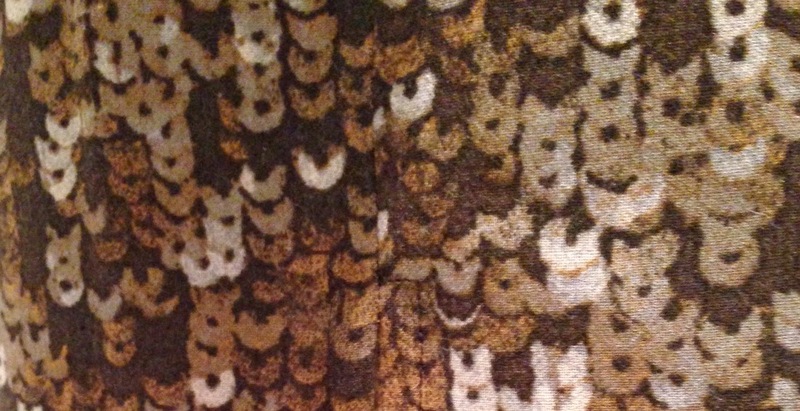 A similar story for the fabric, a wool viscose sequin print bought from ebay. So it was a wearable muslin I was after. It was a really tight squeeze to cut the pattern out as I only had 2 metres of 145cm wide fabric which I shrank slightly when I prewashed it compared to the 2.1 metres of 150cm wide needed, so no pockets! I cut an 8 top and widened to a 10 round the hips although I think I could have cut a straight 8. I totally forgot to get any pictures taken on Christmas day so Dolly is modelling. I'm still not sure about the fabric or the pattern but I think its probably the colour that I'm not keen on. Note to self: don't buy any brown or beige fabric it the future! I never noticed this pattern but I think in a different fabric and worn with boots it could be a useful addition to the winter wardrobe, I like the shape.Perhaps browny shades are best left to mousy old ladies?! I agree, I think its a nice pattern just a wrong fabric choice unfortunately! I love this dress and can't stop looking at your lovely version as I try to decide what next to sew for myself! I especially like the sequin print. This is a genius way to get a dressy looking dress without having to sew sequined fabric. Lovely work! Thanks! I would recommend this pattern - its easy to sew and wear!